This meant that the functionality does not require the user to be a geek. The average individual user can understand and use the App functionality without any external help. 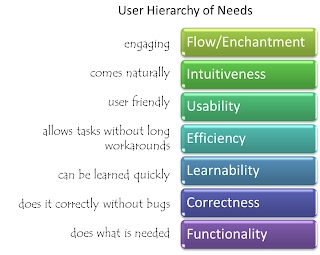 Majority of the Consumer Apps are heavily focused on the Efficiency and Usability part. Few of the Apps have been able to enchant and engage the user (e.g. Angry Birds). In the enterprise world, the device is most likely to be powerful desktop/laptop with a large screen. The connectivity is via LAN or broadband. As a result the Enterprise Applications are more industrial with high focus on providing long list of functionality and ensuring the correctness of the same. Consumers facing business applications usually focused on usability, Specialized enterprise applications (e.g. Call Center Applications) focus on the overall workflow efficiency, but majority of the applications are resource intensive, lack efficiency and have high learnability curves. The enterprise user experiences the simple, intuitive consumer apps on their mobile devices. With the advent of BYOD (Bring Your Own Device), enterprise user’s started bringing their smart devices into the enterprise. Soon the users are comparing the experience of consumer apps with the enterprise business apps; they wonder why the enterprise apps can’t provide a similar experience. 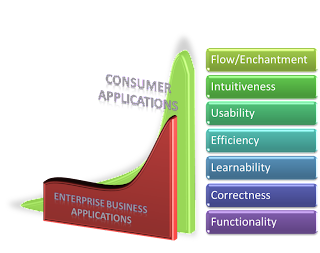 Why are the enterprise apps so low on learnability, efficiency, intuitiveness factors? The whole idea behind the Consumerization of IT is not just measures like BYOD but to bring the missing intuitiveness, usability and efficiency into the enterprise applications. So, what does Consumerization means for the Architect? The impact of consumerization on the Enterprise IT will be felt in the years to comes, BYOD is just the harbinger of things to come. The penetration of technology and internet to the people has made e-commerce possible. Even some years back, there were only a few players in the e-commerce business and their consumer base even tight. But now there seem to have been a bubble burst and everyone is going online for their business. People are buying online, they are selling online. What’s more, the world seems to have enough people to buy your stuff. Its just amazing how the internet has accelerated business growth.